Abrasion: This is caused by the interaction of teeth and other materials rubbing or scraping against them. The most common source of abrasion is traumatic toothbrushing, meaning that you are using a toothbrush that's too hard or applying too much force when you brush. 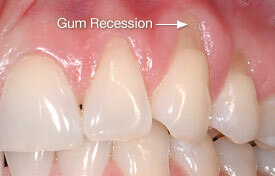 This can affect the root surfaces of your teeth just below the gum line or the enamel above the gum line. Other causes of abrasion can include improper use of toothpicks and dental floss. 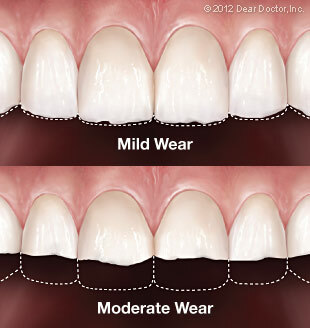 Some dental appliances such as retainers that are frequently taken in and out of the mouth can also abrade teeth. Abrasion can also result from a diet loaded with abrasive foods like sun flower seeds and nuts or habits such as nail-biting and pen-chewing.